The Remake is Like a Roller Coaster! As you can see from the news below, the Creature From the Black Lagoon remake is up and down like a roller coaster. One moment the movie is set to be produced and the next moment it is languishing on a writer's desk. Until the Wolfman remake, the movie was slated for release in 2011. After poor profits from the Wolfman, Universal shelved the project - until Apri, 2012 when Dark Universe announced they were making remakes of all the Universal monster movies. With the recent release of The Mummy, some are doubting the future of the franchise. The remake was originally reported to be budgeted for $90 million back in 2009; however, that budget will surely be much more with a re-attempt at a remake. 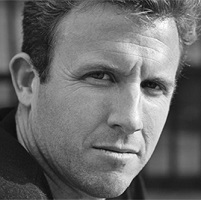 Carl Rinsch was the latest director to be attached to the project (Breck Eisner later withdrew due to his schedule) with Gary Ross of Larger Than Life Productions. That will also surely change with Dark Universe now in charge. Below you can read a chronological history of the CFTBL remake. Visit IMDb for the latest on production crew names. "It suffered from the realities of development hell and a writers strikes," he says. "I don't think it will see the light of day for a while." Does he think The Wolfman's history and box office hurt the Creature's chances of a comeback? "Yep, oh yeah. Between that and spending a lot of money in development, it's money against the movie. When a movie is that close to happening, it takes a long time for people to forget about spending that money and to be re-engaged in it. I'd love for somebody to make that movie. It won't be me." It is up in the air who will play the male lead in the remake at this time. Bill Paxton was originally reported to have signed. With Bill out of the running (see 1/11 entry below) it will be curious to see if Brian Steele will still play the Gillman. Scarlett Johansson was named as the female lead standing in for Julie Adams from the original 1954 film. With new producers names for the remake, this may change. With news that Universal may also turn the Gillman into an action hero, anything is possible at this stage of the game. One has to scratch one's head about this turn of events. To many baby boomers who grew up on the original Universal monsters, the thought of the Gillman as a Green Hulk-like action figure curls the hair. 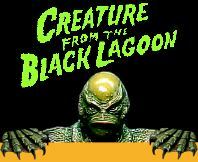 Universal Studios registered the domain name creaturefromtheblacklagoon.com on July 21, 2006. We are hedging our bets that this will be the domain for any remake, or now since they have postponed it indefinitely, some other venture. For now, the domain goes to a link farm. They have since removed their name as the owner of the domain. Got a scoop on the latest news of the remake? E-mail it to me! Rob Zombie Will Not Be Doing the CFTBL Remake! "Fake news. Fyi before people start asking me about this. I have no idea what this article about. I am not interested in developing this project. I think I said it could be a cool remake. That’s it. Ugh, internet." Guillermo del Toro's new film, 'The Shape of Water' was inspired by 'Creature from the Black Lagoon.' Says Del Toro, "For me as a kid, at age six, I watched 'Creature from the Black Lagoon' and I always hoped they would get together. But that was impossible. So it has taken 57 years to remedy that!" Although 'The Mummy' has been a disappointment for the studio, Landis is certain they can make the other films a success because there is a history of great remakes in the genre. Landis is not shocked that Universal's 'The Mummy' reboot - which has kicked off the Dark Universe - has under-performed at the US box office because the film, to him, seems to be more focused on the cast rather than the supernatural foe of the title. Mummy Director, Alex Kurtzman says of the Universal Monster franchise, "These are global films. So it's going be dependent on the nature of each monster. Creature from the Black Lagoon is the Amazon. Spoiler, by the way." It's nice that Universal is at least keeping the location the same. Because The Mummy remake didn't have a good opening weekend, it is questionable if Universal will go ahead with the CFTBL remake anyway. 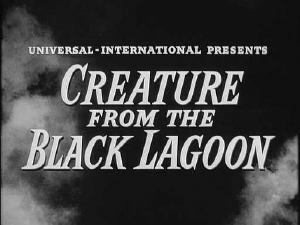 Apparently Universal has shelved all previous scripts written for the remake and is now tapping Will Beall to write The Creature From The Black Lagoon. He recently scripted another underwater movie, Aquaman. Chris Morgan and Alex Kurtzman are now listed as producers. As you can see by the collection of news on this page, they have gone through producers and actors like hot cakes. We believe that the success (or lack of) of the upcoming Mummy remake on June 9 will ultimately decide if Universal goes ahead with the CFTBL remake. At one time, Bill Paxton was to be the star of the movie. Tragically, he lost his life February 25 following heart surgery. There is no word on the further involvement of Gary Ross in the venture. CFTBL never happened - reportedly because of a disagreement over its 3D presentation. Landis was determined to make the movie 3D, just as the original had been shot in 1954. Universal, meanwhile, had other ideas; the studio didn't want the Creature remake to distract attention away from Jaws 3-D. The Amazing Spider-Man 2's Jeff Pinkner has been brought on to rewrite the remake of CFTBL. Pinkerton is currently adapting Stephen King The Dark Tower for Warner Bros. Why Universal is once again rewriting the script has not been revealed. Universal is tapping actress Scarlett Johansson to play the part of Julie Adams in the 1954 version of the movie. Scarlett has starred in several Marvel films and will be in the upcoming Avengers movie. There is no word if this remake will be in conjunction with or replace the action/adventure series that was mentioned in February. The screenplay will be by Ross, Jeff Blitz, Tedi Sarafian, and Paul Schering. Gary Ross, Robin Bissell, Marc Abraham and Eric Newman are said to be producing. We have been at this spot before, only to have production put on hold once again. Stay tuned for the latest developments! The Gillman is Going to be Taken Out of the Horror Genre and into Action/Adventure? Says Universal, "We don’t have any capes [in our film library]. But what we do have is an incredible legacy and history with the monster characters. We’ve tried over the years to make monster movies — unsuccessfully, actually. And we had an epiphany, which is that the horror genre has a ceiling; it’s not global. There’s a reason why monster characters are enduring, generation upon generation. So we took a good, hard look at it, and we settled upon an idea, which is to take it out of the horror genre, put it more in the action-adventure genre and make it present day, bringing these incredibly rich and complex characters into present day and re-imagine them and reintroduce them to a contemporary audience." 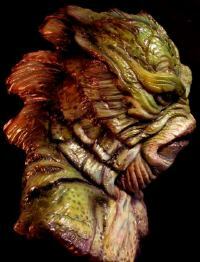 The Gillman to Become an Action Hero in a Super Hero Movie?? "Universal Studios recently hired a slew of new writers for their announced Universal Monsters franchise, which will create a brain trust of “Monster Men” for the rebooted series. A broad swath of characters have been mentioned in conjunction with the project, including less-remade properties like The Creature From The Black Lagoon and Van Helsing." 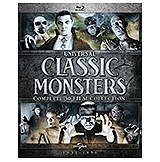 "Universal has announced that the next installment of its Universal Monsters universe will land in theaters April 21, 2017... The Wolf Man and Frankenstein’s monster seem like the most likely featured monsters to follow The Mummy to the screen given their high profile, but it’s easy to see the appeal of a lesser-known but still iconic monster The Creature From the Black Lagoon, which would give filmmakers considerable leeway to re-imagine the subject’s introduction to audiences." What will the New Gillman Look Like? Breck Eisner, who was on board the remake back in 2008 says Spectral Motion (Hellboy) had redesigned the Gillman for him in the remake that has yet to be produced. The question now is will the movie that has been in the works for several decades with various different writers and directors attached will ever see the light of day? Universal is back at the drawing board. "Kajganich (See image above) will be starting from scratch on Black Lagoon, rather than rewriting any of the earlier drafts. Contrary to previous reports that Carl Erik Rinsch was in talks to direct, Black Lagoon has no director at this time." Kajganich is a great pick for the script because several of his remakes have done well with both those who loved the originals and the new generation of viewers. His remake of "Invasion of the Body Snatchers" was both accurate to the original as well as updated for today's generation of horror movie watchers. Additional remakes of his include "It," Pet Sematary," and "The Stand." "We’ve gone through a bunch of different incarnations of scripts, and none that me and my partner were satisfied with," said Abraham. "Gary Ross is involved with us as a producer [along with] his wife, Allison [Thomas]. None of us have been satisfied. I think we have a really cool take on the movie now – [a] much hipper, [more] interesting version of it, and we’re looking for a new writer who’s after that. And, in fact, I just had breakfast and I was writing down my notes about it, about how I think it should go. I think we have a really cool take on it. Still set in South America, really a more 'not-a-guy-in-a-rubber-suit'… [It’s a] much more psychological transformation, more literary transformation. I think a really interesting idea," says Marc Abraham. Universal Pictures is in early talks with Carl Erik Rinsch to direct “Creature From The Black Lagoon. Rinsch shoots highly visual commercials for RSA owners Ridley and Tony Scott. The Scotts once courted Rinsch to direct a prequel to “Alien,” until Ridley Scott decided to helm that film, returning to a franchise he originated. Rodriguez said that he's producing the remake of The Creature From the Black Lagoon now. He announced this at the Comic-Con convention. Vincent Guastini's production company sent photos to Fangoria magazine of designs they were commissioned to create for the upcoming movie. Says Gaustini, At this moment, I have some idea which direction they're going in, but as of now, it’s still ongoing and we’ll have to see what the outcome of this will be. These are my ideas that are both traditional and freshened up, without destroying the classic original... Whatever happens I feel very confident that whichever direction Universal goes in will be the right one. Eisner is out! Who will direct now? Eisner says he is no longer associated with the Creature remake. He is busy with other projects, including the movie, The Crazies. Strike Entertainment and Universal are now looking for a replacement. Eisner told IGN Movies about the latest, "I want it to be scary. It's a bigger movie, so it's not an R rated scary, it's gonna be a PG-13 scary. CREATURE takes you to a place you've never been before, it's one of the last untamed places on the edge of the Earth where you find this creature that has been living and hiding there forever, basically. It's definitely going for a dark adventure tone, but I want it to be scary." Breck Eisner was interviewed recently and says that the remake is not a done deal. The remake depends on the success of the Wolfman remake. I think they're probably going to see how The Wolfman does and then I think we'll know from there," says Eisner. Marc Abraham, the director of "Flash of Genius" is now working on the remake of the Creature From the Black Lagoon. The movie is currently in pre-production. He is also pursuing a prequel to "The Thing." Bill Paxton is out... at least for now! Bll Paxton tells If Magazine that he is not involved with the remake in any way. He says the listing on IMDb is incorrect. He is busing promoting the third series of his show on HBO. He does say, however, that he would like to play the Gillman. "We found some scientific underpinnings for it, which my dad actually felt in the original," Ross said in a group interview in Santa Monica, Calif., where he was promoting The Tale of Despereaux. "In fact, he had based it on a lungfish that was found around that time. So a lot of that was his [input] and kind of the conflict between science and [nature]." With such research, Ross also said that the tone will be straight, not campy. "I don't think we're going to wink at the audience and make it silly in any sort of way," he said. "I think we're going to take it seriously. We're going to treat it with a certain amount of dignity. We're not approaching this in a retro campy kind of way. It's set in present day. There are reasonable scientific underpinnings for it. It should really be a really interesting journey into the jungle both for the characters and for the audience. It's not a reference to what the original is. It's not referential that way. We take it sort of seriously." "It'll draw from the original," he said. "My dad's favorite was The Creature Walks Among Us, the last one which he also wrote. My dad actually just died two weeks ago, so it's a very [personal film]. I think we'll be faithful." By the way, Gary Ross says that he didn't intend to give the impression that Breck Eisner is no longer associated with the remake. Eisner is currently finishing up other projects and will return to focus on CFTBL once he is through with his project(s). The writer's strike messed up a lot of people's schedules and the schedule of Eisner is one of them. Creature From the Black Lagoon does not yet have a green light, but Ross is confident it will come together next year. "The movie is not green-lit," he said. "Let me say that. We hope to be making it sometime next year, so I don't want to send the wrong impression. We feel it's going to be. I think it'll be a very interesting movie." One of the locations for production of the CFTBL remake is near Pacaya-Samiria in Peru. Many people call that part of the Amazon the "Forest of Mirrors." Pacaya-Samiria is about 120 miles (190 kilometers) from Iquitos. The Marañon River runs through that area. The Pacaya-Samiria National Reserve is nearby and is called the "Jungle of the Mirrors." You can find out more information and view images on this area on the Great Peruvian Travel Agency website. Eisner talks more about this location in the entry on May 5. Below is a video of lagoons near the site of production. Eisner tells iF magazine that he is still writing the script. They have been shooting exteriors in the Amazon and interiors here. Breck says that the movie will be a present-day period piece as the original movie was to the 1950's. They are still debating whether to do the movie in 3D. Breck also reports that the Gillman suit will be partly CG. Says Eisner, "[The creature is] very faithful to the original. Anthropomorphic absolutely -- the only difference is he’ll swim a little better. The original swimming scenes in the original were awkward, because of the limitations of the suit, so he’ll be a little more comfortable in the water." 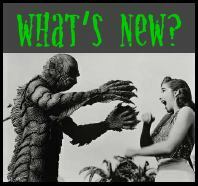 Members of the Creature from the Black Lagoon list group already have read about an accidental peak at the Gillman costume now in production. A fan was able to peak in a room at Universal and saw a tall model of the creature being formed, probably by Tim Flattery. The fan said the face is more stream-lined, green and very similar to the original. "I want it to be authentic; I want it to be a sea of green rather than CG," said Eisner in an interview after a news conference on May 2 in Pasadena, Calif., to promote NBC's Fear Itself. "It is certainly easy to update the story. It was shot in modern times at the time it was originally made, and this will be shot today in the Amazon. We are updating the tone of the original." Writer Gary Ross, who was nominated for best original screenplay for the Tom Hanks fantasy Big, has updated Creature From the Black Lagoon for Eisner. Eisner said that a telephone pole and wire is clearly visible in some shots in the first Creature film, which was shot mostly on the Universal Studios back lot. "Of course, in those days nobody thought you'd be able to stop the film and freeze the frame," the director said with a laugh. "We had a crew in the Amazon in Peru... We found a place called the Forest of Mirrors, because you can see [from] overhead [that] there are so many lagoons on a thousand-mile green-carpet river, and we found the lagoon we're going to shoot in." He said the river water level drops 50 feet in the winter months. Eisner will tackle the Creature after he is done with a remake of George Romero's The Crazies. He originally intended to do the SF horror thriller remake after doing Creature, but decided to reverse the projects. Both are being done for Universal. "We scouted the movie last year but got shut down when the writers strike happened," Eisner explains to us. "We had a crew in the Amazon where we're going to shoot all of the exteriors. We're shooting in Manaus, Brazil and on the Amazon in Peru. I want it to be authentic. I'm a big fan of Werner Herzog and Fitzcarraldo. Herzog got that authenticity. He shot in Manaus. So, we scouted for a month. There's this place called the Forest of Mirrors, because there are so many lagoons on a thousand mile green carpet river, and we found the lagoon we're going to shoot in." The new Creature will take place in a contemporary setting, and, will feature a mixture of CG and practical FX. "The Creature has been designed, we've spent six months designing him." Eisner says Spectral Motion has built a maquette based on an appearance created by Mark "Crash" McCreery (Jurassic Park, Pirates of the Caribbean). "We went top shelf on it. It's very faithful to the original, but updated." Asked if he was turning the Creature into a huge action spectacle like Universal's Mummy films, Eisner expresses a noted reverence for the studio's atmosphere-soaked originals like James Whale's Frankenstein and George Waggner's The Wolf Man. "We debated tone a thousand times. For me tone is the most interesting thing a filmmaker has and so the Creature is a creature, it's not a monster. That's my number one thing about the movie. We're not going to turn him into a monster. He's still going to be empathetic, he's still going to be deadly, he's still going to have a misguided means of expressing his interests in a woman, but it's uniquely the Creature. It's empathy for a deadly creature and tone plays a big part of that." Still, Eisner knows full well Universal is aiming for summer movie fare so, "it will deliver of action and excitement, but I want it to be scary. The Creature was scary when it first came out in '54 - it's not scary today - but that's what updating means to me, updating the tone of the original." "The story involves the members of a fossil-hunting expedition down a dark tributary of the mist-shrouded Amazon, where they enter the domain of a prehistoric, amphibious "Gill Man" — possibly the last of a species of fanged, clawed humanoids who may have evolved entirely underwater. Tranquilized, captured and brought aboard, the creature still manages to revive and escape — slaughtering several members of the team — and abducts their sole female member, spiriting her off to his mist-shrouded lair. This sparks the surviving crewmen to action — particularly those who fancy carrying the girl off themselves." The Creature and Hellboy Together? It is now rumored that the Gillman may be appearing with Hellboy in an upcoming movie. Says Mike Richardson, the producer of Hellboy, "There might be something going on but I don’t think that I can talk about it…there might be something that is being discussed." He says that much of it will depend on the success of the upcoming movie, Hellboy 2.